Productive Gaming: Dev Update #7 And we're back! Dev Update #7 And we're back! Lost the domain for a little while, because the registrar wanted to renew it for a much heftier price that I was willing to pay. I wanted to switch do a different registrar but never got around to it. Luckily, this domain was available for registration with google domains for a reasonable price, with free identity protection and email forwarding. I put off work on the HabitEngine for a while, but I've started back. 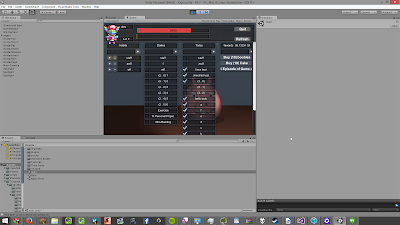 I transferred the project to Unity 5. In the process, I didn't transfer all the folders, so what I thought was a bug was really only a problem I created. However, in the process of trying to fix the bug I created, I found the solution for the scroll bar not being clickable, so I fixed that. I also cleaned up my HabitRPG avatar code so it's not clogging up the console with warnings. I'm working on recreating the GUI using Unity's new UI tools. There should be many advantages to this. Hopefully I will be able to create a more dynamic, customizable, efficient UI that runs well on all devices. Learning the new unity UI is a chore, and I'm working 40 hours a week, so it will probably take me a while. Here's a picture of The Habit Engine, with old GUI, running in Unity 5, with working scroll bar, and minus the console clogging avatar code. So, I thought I might get a habitengine domain if it was available, but apparently a Finnish guy named Janne Haonperä, Chief Marketing Officer for http://www.cloudriven.fi/, has bought up all the domains. I might try to contact him about it. Janne, if you're reading this, can haz? Fell free to suggest name changes, in case it has to come to that one day.